27 May 2018 – Baby Jools & the Jazzaholics: This is the last concert of the season, sadly, but nevertheless what a concert to go out on. This 6 piece band wowed the audience. 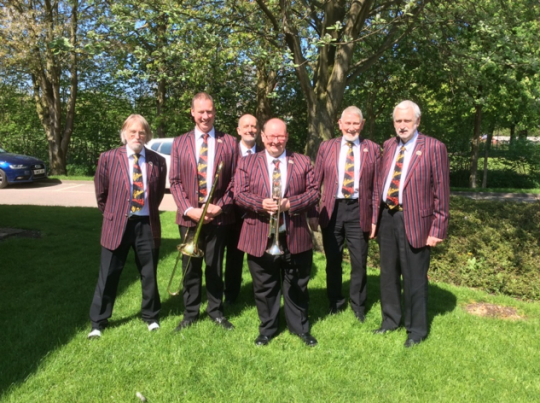 Baby Jools – leader, on drums, Jim Swynnerton on double bass, Mike Owen on trombone, Denny Ilett on trumpet, Karl Hird (from Australia) on reedsc and Brian Mellor on banjo and guitar. Along with “Old Spinning Wheel” was “Travelling Blues”, “Muskrat Ramble”, “Old Rocking Chair”, Black Cat on a Fence", “Lucille”, “A Hundred Years from Today” and the “Chimes Blues”. The band played to a large size audience as SJS members have good memories for good groups and so flocked in to hear Baby Jools. I just know its only a matter of time before they are back at the White Eagle Club once more. 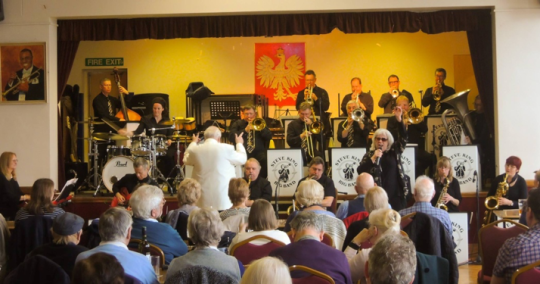 20 May 2018 – Steve King Big Band featuring Lynn Dawes: This band, with traditional Dixieland-style jazz and swing repertoire, has proved popular with SJS audiences. USA born vocalist Lynn Dawes adds to the entertainment. The band leader, with his bright orange jacket and tie, was easy to spot and gave occasional input on his trumpet. Numbers played included: “Ain’t Misbehaving”, "Let the Good Times Roll", “Frankie & Johnny”, “Googletown Races”, “Sweet Georgia Brown”, “What a Wonderful World” and “I Want to be Loved by You”. With 20 musicians in the house you can imagine the music filled all four corners and then some. 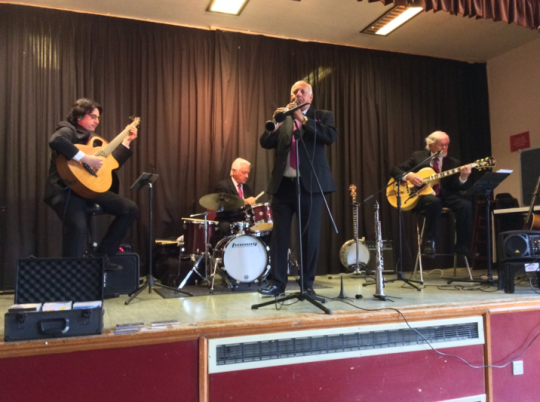 13 May 2018 – Pete Allen & his Hot Rhythm: This four-piece played at the White Eagle Club as part of the Stafford Music Festival. Leader, Pete Allen, is on reeds, Richie Bryant on drums, Dave Hanratty on bass and Dave Moorhead on banjo and guitar. The group injected humour into its programme and the concert was well received by Stafford jazzers. Some of the numbers were: "Nobody’s Sweetheart Now", “Roses of Piccardy”, “Way Down Yonder in New Orleans”, “Lady be Good” and “You Meet the Nicest People in your Dreams”. They finished with a rousing “When the Saints Go Marching in”. 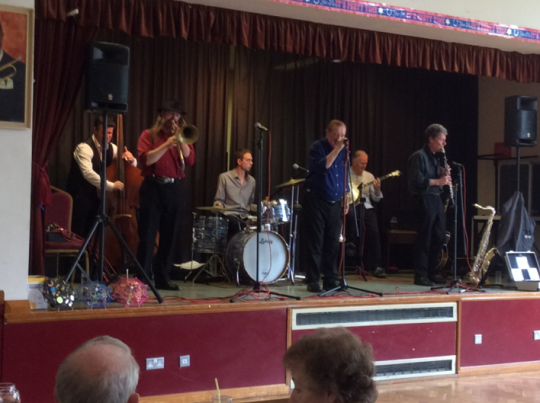 6 May 2018 – Pedigree Jazz Band “Salute to Trad Jazz”: As you can tell from the photograph, the day was one of those rare sunny days and yet there were still many people attending Stafford Jazz Society to hear this concert. The band consisted of leader on clarinet, Chris Walker, on trumpet was Andy Chislett, trombone was Tony Mann, double bass was Mike Bennett, Banjo + guitar was John Noddings and on drums, taking over from Colin Larn who sadly passed away earlier this year, was Jim Newton. The numbers were all recognisable even for beginners with sons such as “In a Persian Market”, “Bourbon Street March”, “Peter and the Wolf”, “Original Dixieland One Step”, “Autumn Leaves” and of course “Midnight in Moscow” and “Stranger on the Shore”. All in all the concert was well received and we look forward to seeing them again next year during Stafford Music Festival.